THE GRINCH (2018) is a great movie about the true meaning of Christmas triumphing over alienation and materialism. It features powerfully loving parents and children, a joyous community of inspired Whos, and a terrific character arc for the Grinch, plus great Christmas carols and hymns focusing on Jesus Christ and His divinity, lordship and love. THE GRINCH takes the Dr. Seuss story and adds a touch of DESPICABLE ME and a pinch of THE MUPPET CHRISTMAS CAROL. The movie opens with an exciting scene of the birds rushing toward Whoville, where the town is full of joy in anticipation of their favorite holiday, Christmas. The Grinch is watching from his mountain fortress. He makes it clear from the beginning that he hates Christmas, but he’s not the same Grinch as previous versions because he does have a heart, although it is three sizes too small, and loves his dog, Max, and other creatures. When the Grinch finds out all his food is gone due to his nervous eating habit, he’s forced to go to Whoville to buy food. There, he’s confronted with joyous Whos singing Christmas carols. Also, he’s confronted by Cindy Lou Who, who wants to meet Santa Claus to tell him her wish, which is to help her overworked but brave and valiant mother. Cindy Lou is an incredible, compelling character, and her relationship with her mother is exemplary. Cindy Lou tries to tell the Grinch what Christmas really means, but the Grinch is determined to destroy Christmas. In a flashback, he grew up in an orphanage where he had nothing at all while he watched everybody in Whoville celebrating Christmas. The Grinch determines to steal Christmas. To do so, he’s going to dress up as Santa, steal a sleigh from his neighbor’s house, recruit a fat, lovable reindeer named Fred to pull the sleigh, and visit every home in Whoville to steal the Christmas tree, ornaments and presents. [SPOILERS FOLLOW] Meanwhile, Cindy Lou has worked with her friends to set up a trap for Santa Claus, so she will wake up and tell him her wish for her mother. Christmas Eve comes, and the Grinch and Max rob most of the homes in Whoville, finally arriving at the last home, where Cindy Lou lives. She thinks she’s captured Santa, but the Grinch thinks she just wants material goods. However, Cindy Lou tells him that she wants to help her mother and when you sing Christmas carols, it brings joy. THE GRINCH is a precious, superbly made movie. In too many movies, a parent is the villain, or a child is a villain, or the villain is unredeemable, but not THE GRINCH. In fact, the mother and the daughter have a very touching scene saying how blessed they are to have one another. How refreshing to see this sentiment in a Hollywood movie, where it promotes motherhood and family. In fact, the entire message of the movie is that the greatest joy in life is to be kind and love one another. The colorful animation in THE GRINCH shows incredible imagination. The humor is delightful. The love is heartwarming. Even the love for Max and the reindeer and his family is touching. It’s a well-designed, well-written, well-organized movie. The movie’s message is that Christmas can triumph over the meanest, most alienated heart and make the heart grow three times larger. 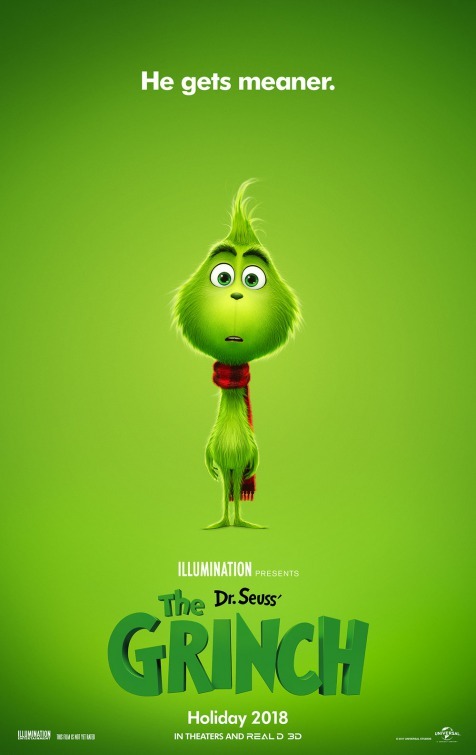 MOVIEGUIDE® fell in love with THE GRINCH (2018); we think you will too. Our hearts grew and grew and grew as the movie filled us with lots of joy and love. THE GRINCH (2018) is a great movie about the true meaning of Christmas triumphing over alienation and materialism. The movie opens with the people of Whoville full of joy anticipating Christmas, their favorite holiday. After watching from his mountain fortress and buying food in Whoville, the Grinch decides to steal Christmas. He will dress up as Santa Claus, steal a sleigh from his neighbor’s house, and recruit a fat, lovable reindeer named Fred. With help from his dog, Max, the Grinch will visit every home in Whoville to steal the Christmas tree, ornaments and presents. THE GRINCH is a precious, delightful, superbly made movie. The colorful animation shows incredible imagination. The humor is delightful. The love is heartwarming. It’s well-designed, well-written and well-organized. The movie’s message is that Christmas can triumph over the meanest, most alienated heart. It features loving parents and children, a joyous community of inspired Whos, and a terrific character arc for the Grinch. Plus, it has great Christmas carols focusing on Jesus Christ and His redemptive love. MOVIEGUIDE® fell in love with THE GRINCH (2018). We think you will too.